The development of novel and more efficient synthetic methodologies in organic chemistry is highly desirable. 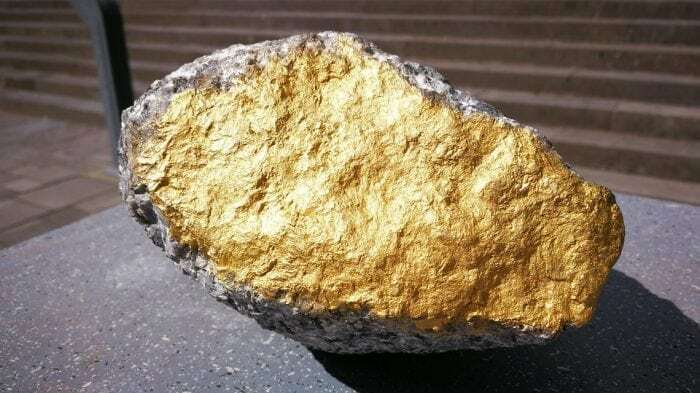 In the last fifteen years, remarkable transformations have been accomplished taking advantage of the high carbophilicity of gold catalysts, and, particularly, of their high affinity for triple bonds. 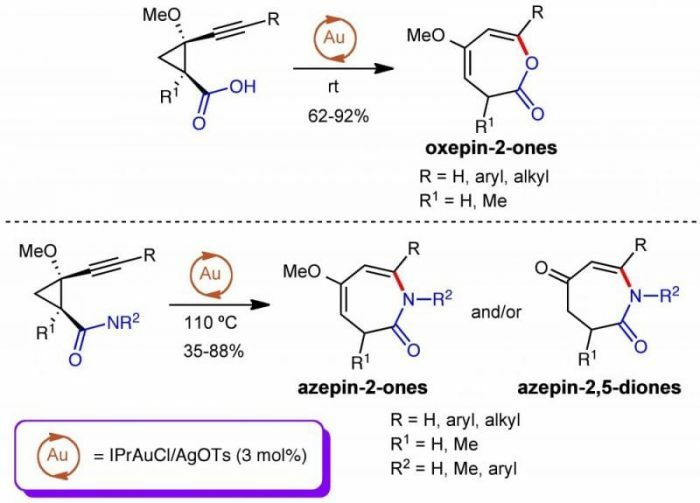 After disclosing a high-yielding gold-catalyzed procedure to access to the oxepin-2-one skeleton (which is present in natural products displaying appealing SERCA-ATPases inhibitory activities, such as basiliolides or trastaganolides) from alkynylcyclopropanecarboxilic acids, we tested our approach as a viable strategy for the preparation of the isoelectronic azepin-2-ones from alkynylcyclopropanecarboxamides. Two major facts encouraged us to explore this option: (1) the occurrence of this skeleton in several natural and synthetic products with a variety of biological and pharmacological activities is already known; (2) there are scarce synthetic methods for the preparation of seven-membered rings (and particularly for nitrogenated heterocycles) when compared with the existing procedures for the synthesis of five- and six-membered rings. Additionally, we also sought to study the cycloisomerization reaction on 2-methoxy-2-alkynylcyclopropanols as it was already known that gold-catalyzed cycloisomerizations of alkynols take usually place under mild conditions and are highly efficient, although their regioselectivity depends on factors such as the nature of both the catalyst and the starting material and the size of the ring formed. The reaction for the formation of azepinones required harder conditions than for the synthesis of oxepinones: heating at 110 ºC vs room temperature. Interestingly, the azepin-2-ones proved to be less stable than the corresponding oxepinones and partial hydrolysis to azepin-2,5-diones could be observed in several cases. Different substitution patterns in the starting material are compatible with these reaction conditions. Thus, the corresponding seven-membered heterocycles were obtained from primary alkynylcyclopropylcarboxamides bearing a variety of aryl groups at the triple bond. For secondary carboxamides, N-aryl and N-Me substitutions are tolerated as well as aryl or tertiary alkyl groups at the triple bond. For reference see Adv. Synth. Catal. 2017, 359, 3035-3051. An exception to the general behavior was found for a couple of primary alkynylcarboxamides bearing cyclopropyl or t-butyl groups at the triple bond. In these cases, moderate yields of 4-methoxy-6-oxo-4-enenitriles were reached. In all cases, the reaction is completely regioselective. The reaction outcome can be explained considering an initial triple bond activation by the gold catalyst. Then, a 6–endo-dig nucleophilic attack should take place followed by a ring-expansion by the opening of the cyclopropyl ring to form a metallated seven-membered heterocycle. However, the dual nucleophilic nature of the carboxamide group accounts for the different skeletons obtained in the reaction. Thus, when the amide behaves as a N-nucleophile, a seven-membered metallated N-heterocycle intermediate is formed which evolves by proto-demetallation to form the corresponding azepinones (or azepindiones). On the other hand, the carboxamide group acts as O-nucleophile for primary carboxamides with alkyl groups at the triple bond; then a seven-membered metallated O-heterocycle intermediate is formed and it evolves by ring-opening and demetallation to the enenitriles. Several experiments performed to determine the stability of the gold-catalyst under the harsh reaction conditions pointed out that IPrAu(OTs) is the initial catalytic species, which is finally converted into IPrAuCl upon the reaction conditions. These latter species proved to have poor catalytic activity. On the other hand, the gold-catalyzed reaction of 2-methoxy-2-alkynylcyclopropylmethanols led to a completely different outcome, and no formation of seven-membered heterocycles was observed for these substrates: oxabicyclo[4.1.0]heptenes (at 0 ºC) or dihydropyranones (at 85 ºC) were isolated instead. 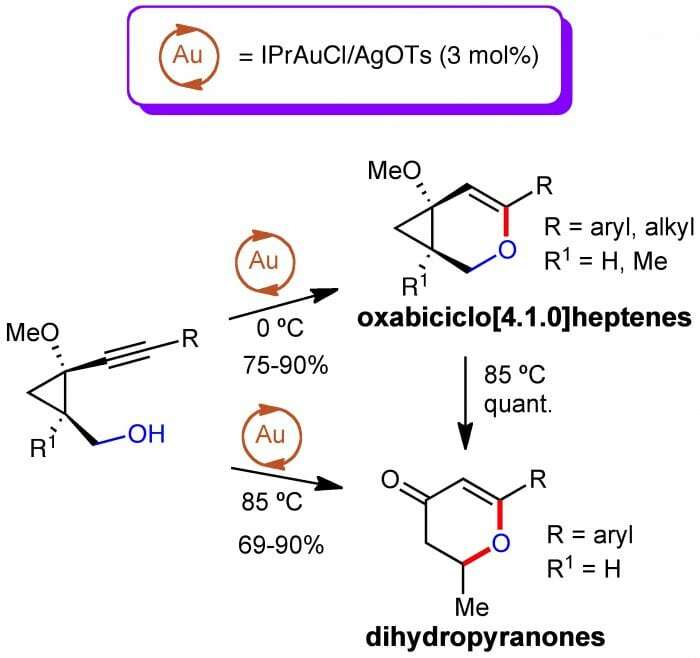 It was also observed that dihydropyranones are also formed by the heating of oxabicyclo[4.1.0]heptenes at 85 ºC in the absence of the gold-catalyst, proving that this catalyst is only required for the cyclization step but not for the ulterior transformation. The scope of these transformations includes alkyl (primary, secondary) and substituted aryl groups for the cycloisomerization but only aryl groups for the formation of dihydropyranones. Some other features of these reactions are: (1) they are high-yielding (75-90% for the cycloisomerization; 69-90% for the synthesis of dihydropyranones; (2) they are highly (but not completely) regioselective, as minor amounts of the 5-exo-dig cycloadduct could be isolated in some cases; (3) indeed, lower regioselectivities were observed when the triple bond was linked to aryl groups bearing electron-withdrawing substituents, which can be attributed to the slippage of the electron density in p-activated alkynes. To explain the formation of the oxabicyclo[4.1.0]heptenes, a nucleophilic attack of the free hydroxyl group to the activated triple bond followed by demetallation would account for the reaction products at 0 ºC. Upon heating a four-step reaction sequence should take place, involving: (i) electrocyclic ring-opening; (ii) 1,3-H migration, (iii) electrocyclic ring-closure, and (iv) hydrolysis, leading to dyhydropyranones. Functionalized cyclopropyl alkynes are excellent substrates for gold-catalyzed transformations. Thus, seven-membered heterocycles such as oxepin-2-ones, azepin-2-ones (or azepin-2,5-diones) can be efficiently prepared from 2-methoxy-2-alkynylcyclopropane-carboxylic acids or –carboxamides. The push-pull character of the cyclopropyl ring is crucial for the formation of the seven-membered heterocycles because of the ring-expansion of the cyclopropane ring. Alternatively, 2-methoxy-2-alkynylcyclopropylmethanols, whose cyclopropane ring lacks the push-pull character, provide oxabicyclo[4.1.0]heptenes at 0 ºC or dihydropyranones at 85ºC. This study, Gold-Catalyzed Cycloisomerizations of Functionalyzed Cyclopropyl Alkynes: the Cases of Carboxamides and Alcohols was recently published in the journal Advanced Synthesis & Catalysis. This work was led by Enrique Aguilar from the Universidad de Oviedo. Enrique Aguilar is a professor at the Universidad de Oviedo.